Trip to 'The Brakes' tonight! After defeat with the final kick of the game in the Vanarama National League North opener on Saturday, Andy Morrell will be looking to rally the troops in order to register the first points of the 2017/18 season tonight, as we prepare to travel to divisional newcomers Leamington. Despite creating the better chances on Saturday, The Lambs were unable to break down a stubborn Bradford Park Avenue defence, and were punished in the 97th minute as Adam Boyes swept home to secure maximum points for the visitors. 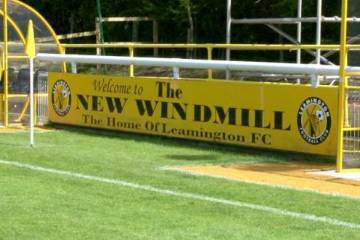 Leamington however returned to National League North in impressive fashion, registering an away win at Gainsborough Trinity on the opening day thanks to an Ahmed Obeng brace. Callum Powell, Dan Jezeph, and Sam Coulson all remained sidelined, however there were no further injury issues on Saturday, so a very similar squad is set to make the short journey across the border into Warwickshire. Following this, we have a long trip to face newly promoted Blyth Spartans on Saturday, before a home double header with Boston United and Curzon Ashton.